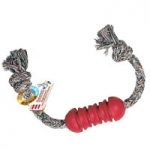 This great bone-shaped kong aids in effectively cleaning teeth and gums. It also comes with a premium quality floss rope. Good for small breeds.